Labh Garh Palace Resort is located in the foothills of Cheerwa Ghats and is a premium destination for business and leisure travelers. The resort is surrounded by the scenic beauty of the Aravali hills and boasts of a garden as well. The resort lies close to Amarakh ji Mahadev Temple, Eklingji Temple and other places of attraction around it include City Palace, Bagore Ki Haveli Museum, and Lake Pichola. The resort offers a plethora of mind exercising activities to indulge in like an outdoor swimming pool, indoor games, gym and a pool table. The resort also has a pool for kids and pets are allowed inside the hotel. To detoxify the mind, body and soul the resort has a spa on the premises. Apart from these services the resort has 24-hour security, laundry services, a gift shop and a salon. The resort has a well equipped staff to handle conferences and small get-togethers. The guests can also request for airport transport at a surcharge. The resort has a total of 41 rooms that are divided into Super Deluxe and Deluxe rooms. All rooms are air-conditioned and come with 24-hour room service. Sooraj Mahal, Jannat, Sagar and Bamboo Beats are the main restaurants and bars of the hotel. 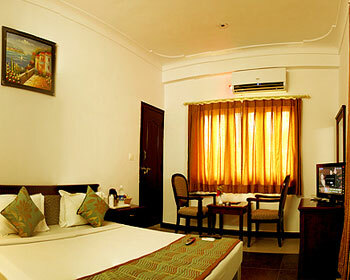 Super Deluxe rooms are quite comfortable and provide all creature comforts necessary for a stay. The interior of the rooms is beautiful to look at and the room is airy and spacious. The rooms are furnished with large double beds and essential furniture. The various in-room facilities include Satellite T.V, Wi-Fi, direct dial telephone, mini bar, tea/coffee maker, safe, fruit basket, newspaper, iron, and refrigerator. The attached bathroom has all modern fittings and comes with 24-hour running hot/cold water. 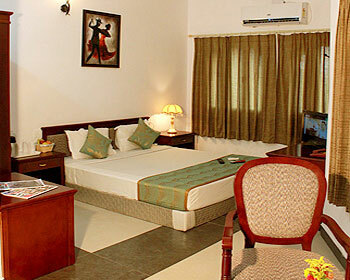 Deluxe rooms come with various amenities and are well ventilated. The rooms are tastefully done and furnished with large double beds or twin beds. The different amenities provided are mini bar, Satellite T.V, Wi-Fi, Safe, tea/coffee maker, direct dial telephone, newspaper. The private attached bathroom has a supply of 24-hour running hot/cold water. Sagar is the poolside bar and restaurant of the hotel. Since it is located outside the restaurant presents with a memorable experience to its guests. One can enjoy a drink from its fine selection of wines and spirits. To accompany the drinks, the restaurant serves vegetarian and non-vegetarian dishes to its guests that are lip-smacking and tasty. Sooraj Mahal is a nice restaurant whose interior is done very warmly. The restaurant offers mouth watering dishes to its guests. Choose from a wide selection of Indian, Continental and Chinese dishes. The spread laid out is a delectable affair. A cup of coffee soothes the senses and the Garden Café does just that. It is located outdoors and is an ideal place to drink your coffee while enjoying the view of the mountains. The other items on the menu include snacks and a few dishes. Bamboo Beats is the new discotheque and pub in the resort and is the hang out place not to be missed by the young crowd. Not limited to the young, anyone can enter this pub and groove to the vibrating and fresh music by the resident DJs. No dress code is required but only a fun attitude and a few drinks that will get anyone started.